I was wandering around Pioneer Square Seattle, Occidental and Yesler area, and looked up. What a fabulous Ghost sign! Have lunch over Seas! I say there! Save me a seat. But underneath this sign is another earlier one for the Washington State Ferries, and then a sign for Sperry’s Flour Co. Spoiler alert, apparently the Washington State Ferry’s was painted on purpose to look old in 1978. So a created ghost sign over some real ghost signs! But I still love the idea of having lunch over seas! 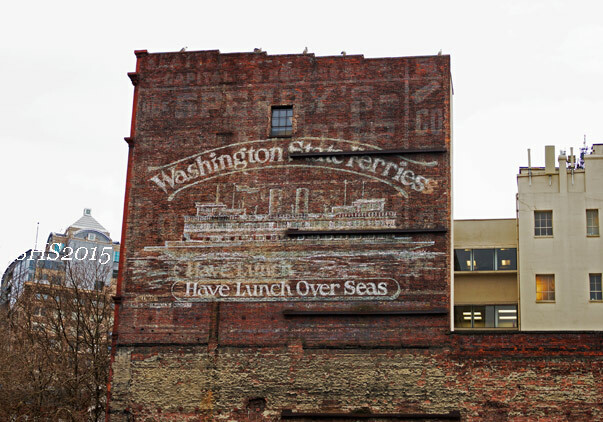 Gallery | This entry was posted in Ghost Signs and tagged Ghost Signs, Historic Seattle, Occidental, Old Advertising Signs, Pioneer Square, Seattle, Sperry's Flour Co, Washington State Ferries, Yesler. Bookmark the permalink. It sounds like you are overdue for a ferry ride. You can have lunch on there! I am overdo for one! I need to go do the pikes place area next. Then a ferry ride to…choices..bainbridge…vashon..
Do it! More, more! Do all of the above. I had no idea what those faded old painted signs were called! “Ghost Signs” this is so good to finally know…thank you! !